Named for: Hungabee is the Stoney Indian word for "chieftain" and was chosen because the mountain is higher than its neighbouring peaks.. 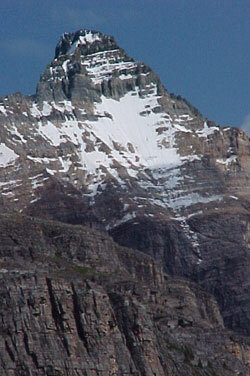 Together with Mount Victoria and Mount Lefroy, Mount Hungabee is one of three peaks over 3400 metres which dominate the Continental Divide in the Lake Louise area. 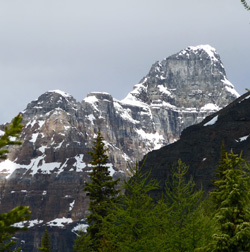 The tallest and most rugged, Mount Hungabee rises above the headwaters of four beautiful alpine valleys, Paradise Valley and the Valley of the Ten Peaks in Banff National Park, the Lake O'Hara Valley in Yoho National Park, and Prospector's Valley in Kootenay National Park. 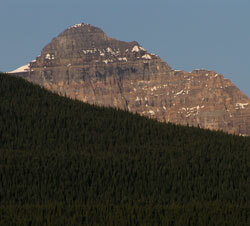 Enjoying a good look at Mount Hungabee is a challenge for the roadside viewer but it is possible. Early morning light is a definite asset and a scramble up the road cut will help as well. 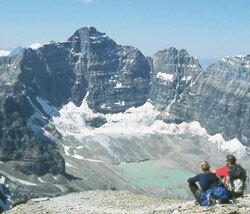 The location is a short stretch of the Bow Valley Parkway between the Morant Curve and Lake Louise, where the view to the southwest follows Paradise Valley to Mount Hungabee at its head. 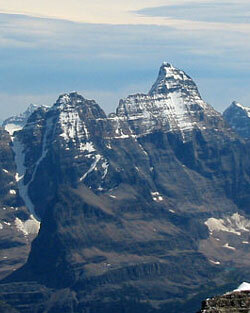 In his book, "The Rockies of Canada", Walter Wilcox describes the mountain as it is seen from Paradise Valley as follows: "The upper part of this valley is hemmed in by an encircling line of mountains, and abruptly terminated to the south by a bare precipice which rises in a wedge-shaped peak called by us Hungabee or The Chieftain." Hungabee is the Stoney Indian word for "chieftain". 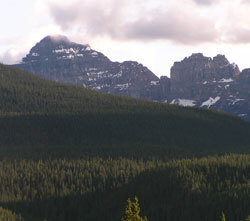 In Volume I of the Interprovincial Boundary Survey, Arthur Wheeler wrote, "It (Hungabee) is the central peak of the region and one from which five distinct valleys radiate, all famous for their scenic beauty." The first ascent of Mount Hungabee by Herschell Parker, Christian Kaufmann, and Hans Kaufmann was an exciting day as the party had to make its way across a gap in the arete leading to the summit. Parker later wrote, "...slowly and carefully, while firmly grasping the rock on one side, Christian thrust his feet forward until they touched the other and his body bridged the chasm; then a strong forward swing, and he stood safely beyond the gap. For me, aided by the rope, the matter was far less difficult and soon we made our way over the intervening arete, gained the corniced summit, and Hungabee, the grim old 'Chieftan' was conquered." In 1894, Samuel Allen, Walter Wilcox, and three others paid $12 per week for accommodation, meals, and the use of horses and a boat at the first chalet on the shores of Lake Louise. 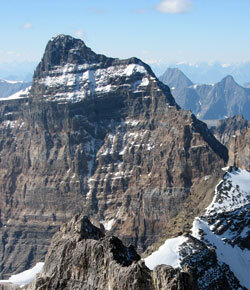 Allen and Wilcox had visited the area the previous year and had failed in attempts to climb Mount Victoria and Mount Temple. But they had big plans for the summer of 1894. They referred to themselves as the Lake Louise Club and were bent on exploring, climbing, and mapping in what was then uncharted wilderness. 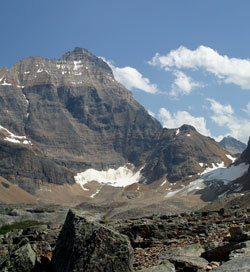 Following an accident on Mount Lefroy in which one of their party was injured, the "club" focused on less risky explorations, discovering Paradise Valley and the Valley of the Ten Peaks above Moraine Lake. 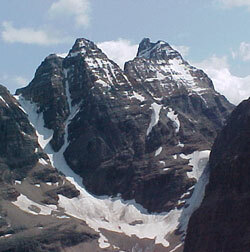 They also completed first ascents of two easier peaks, Mount Aberdeen and Mount Temple where, "Many a hearty cheer rent the thin air as our little party of three reached the summit, for we were standing where no man had ever stood before, and...at the highest altitude yet reached in North America north of the United States boundary." During September, Allen made a most impressive solo trip over Wenkchemna Pass, visiting the Eagle Eyrie and reaching Opabin Pass from where he named Mount Biddle, Mount Huber, and Ringrose Peak. Later in that same year he visited the Lake Oí¢ä‰åä‹¢Hara area and, together with Yule Carryer, an Indian student from the University of Toronto, became the first to reach Abbot Pass. 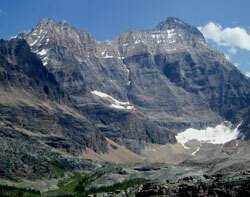 The following day Allen and Carryer climbed to the col now known as Wiwaxy Gap from which Allen enjoyed, "the most consummate view, from an artistic view, that I have ever seen in the Rockies." By the end of the summer they had explored over one hundred square kilometres of country around Lake Louise, chosen the names of many of the lakes and mountains, made a detailed map, and measured the depth of Lake Louise. The first ascent of Mount Hungabee by Herschell Parker, Christian Kaufmann, and Hans Kaufmann was an exciting day as the party had to make its way across a gap in the arete leading to the summit. Parker later wrote, "...slowly and carefully, while firmly grasping the rock on one side, Christian thrust his feet forward until they touched the other and his body bridged the chasm; then a strong forward swing, and he stood safely beyond the gap. For me, aided by the rope, the matter was far less difficult and soon we made our way over the intervening arete, gained the corniced summit, and Hungabee, the grim old Chieftain was conquered."